A special way to honor a new Eagle Scout is to have an American flag flown over the United States Capitol. For our troop, requests for flags are made to either of Alabama's U.S. Senators, Richard Shelby or Doug Jones; or the Third District Representative, Mike Rogers. The flag comes with a certificate stating that it was flown over the Capitol on a certain date in honor of the person you specify. Flags can be ordered in various sizes and materials. In addition to the cost of the flag, a handling charge is also added. If the flag is to be flown on a specific date, such as a birthday, the date of the Eagle Board of Review, or the day of the Eagle Court of Honor; the request should be mailed with as much advance notice as possible. Plan for four to six weeks ahead of the date the flag should be flown and expect two to four weeks afterward to receive the flag. 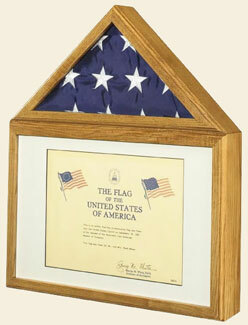 Display cases and frames are available online or from most craft stores in the area. © BSA Troop 50 of Auburn, Alabama Please report any issues or needed updates to the troop webmaster. Click here to e-mail.